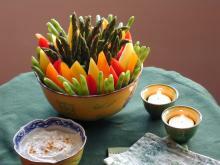 Bland, boring broccoli florets and carrot sticks have given crudités a bad rap. But when you serve crudités with interesting flavors, colors, and shapes and a scrumptious dip, your guests will devour them. Our mom turned us on to this dip. She found the original recipe in a Southern Living Party Cookbook that’s almost as old as we are. Good recipes survive forever! Mix all the ingredients together in a bowl. Add salt and pepper to taste. Quarter the peppers and remove the core, seeds, and ribs. Cut each quarter in half diagonally so you have two triangles, each with a curved base. Score the cucumber lengthwise with the tines of a fork to remove strips of skin, creating stripes. Cut the cucumber crosswise in half or in thirds, depending on how long it is, to make 4- to 5-inch-long sections, then cut each section lengthwise into slim wedges. Blanch the asparagus spears and the snow peas at the same time: Drop them into a pot of generously salted, boiling water and cook until you can pierce the asparagus spears with a fork but they’re still crisp, 3 to 5 minutes depending on the thickness of the spears. (The snow peas are more forgiving, so focus on whether the asparagus spears are done.) Immediately plunge the vegetables into a bowl of ice water until they’re no longer warm. Pat dry with paper towels. To make an appealing display, serve the vegetables standing up in a bowl instead of laying them flat on a plate or tray. Makes approximately (very approximately!) 100 pieces and about 1 1/2 cups of dip. All the vegetables can be cut and blanched (if necessary) 1 day ahead. Keep them in the refrigerator loosely wrapped in damp paper towels. The dip can be made 3 to 4 days ahead and kept covered and refrigerated.